No other garden design company operating in the Hamptons has a stronger commitment to this credo: Inspired gardens can be done smartly, efficiently, and with great lasting style and ecological sensitivity. 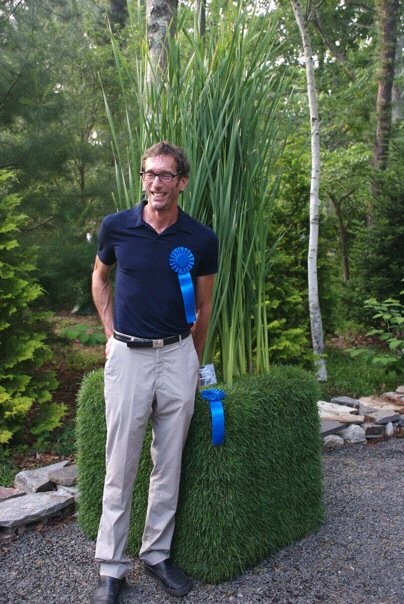 Geoffrey Nimmer Landscapes creates and cares for some of the most beautiful landscapes and gardens on the North and South Forks of Long Island - always with an eye toward the ecological impact our actions will have on our surroundings and the economic impact they will have for our clients. The specifics of each site and the needs, desires, and personality of each client are the first things we take into account. Economic, timely (and quite often phased) installations proceed only after a strong design has been developed. Horticulturally responsible and ecologically sensitive maintenance ensures that our clients' gardens grow in richness as they mature. In short, having a beautiful, ingenious – and perhaps indigenous – garden need not break the bank. A thoughtfully conceived landscape is a work of art. When cared for properly, it should not only enhance the value of your home, it should enhance our larger world and bring lifetimes of enjoyment. As a modern dancer traveling the world with the likes of Lucinda Childs, JoAnn Fregalette-Jansen, and Robert Wilson, Geoffrey Nimmer was exposed to gardens of every genre. After receiving his horticulture degree from UCLA, he designed, installed and cared for gardens in L.A. and New York, working for garden designers such as Halstead Welles and Jane Gil. In 1999, Wilson and Nimmer reconnected, with Wilson inviting him to help with the development of the gardens at his newly formed lab for the performing arts, the Water Mill Center. He served as head gardener at the center for the ensuing 3 years. His ongoing education in organics and the native plantings of Long Island brought about a desire to form a different kind of gardening and design company: one that would provide tailored design and maintenance of gardens, utilizing sound ecological techniques - in a cost-conscious manner. Geoffrey Nimmer Landscapes enjoys great collaborative relationships with its clients, fellow designers and artisans, and has completed residential and commercial landscapes and gardens of every shape, size and budget. In addition to running, Geoffrey practices and teaches yoga in the Hamptons. Incorporating this spiritual practice into the business of garden design, he recognizes the connection between all living things and the world in which we live.